The Quest is now available for preorder on Kindle! Click here to be taken to Amazon. Thank you all for your patience as I rerelease this series. My goal is to have the second book in the series out in early December. Also, I’ve been working on making covers, as the lovely Desiree DeOrto has been teaching me. This is my first cover project and I hope you all enjoy it! I have officially taken back the rights to my book The Quest (Sanshlian Series book 1) and am working on getting that edited, along with the second book in the series The Journey. I have sent both to my editor and am waiting to hear back. Meanwhile, I will be working on a new cover and hope you all will stay with me while this series keeps going. I’m sorry about the wait, I ran into some problems with the publisher. Endangered is now available! And join us RIGHT NOW for the release day party! I’m proud to say that Endangered is now available as a paperback and ebook! And right now we are having a release day party with many different authors and artists having takeovers and giveaways! Please join us in having some fun by clicking here! We are getting closer to the publishing day of Endangered! Who’s excited??? To celebrate, I am hosting a giveaway on Goodreads! Check it out below! Giveaway ends May 10, 2016. I am also having an Online Release Day Event where a bunch of authors and artist will be taking over the even as well and there will be a bunch of giveaways! Click here to join! Less than a week! Yay! 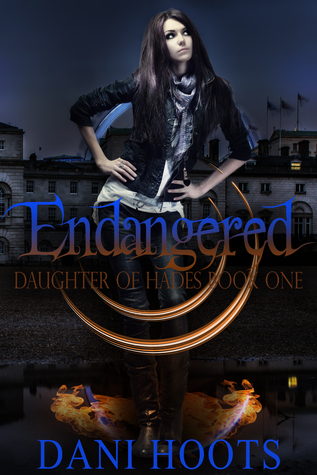 I am happy to present to you Endangered, my first book in the Daughter of Hades series. This book is available for preorder on Amazon Kindle and Antik Comics. Links are below. Be sure to add the book to you “Want to Read” list on Goodreads by clicking Here! I proud to reveal my cover for Endangered (Daughter of Hades #1)! I am so excited to release this book to you all in less than two months! Please add it to your Goodreads “want to read” list! The preorder will be available in the next couple of weeks, so keep an eye out for that!